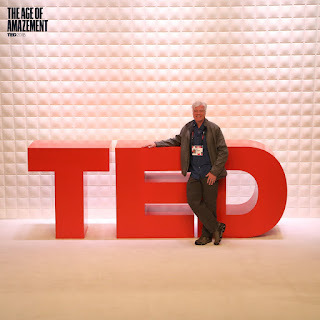 I’ve been attending the TED or TEDActive conference for over ten years. 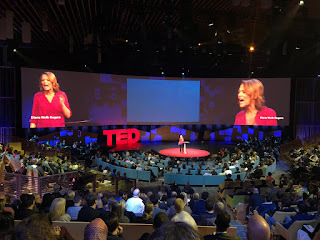 I come to have the TED talks and participants force me to think. I do my best to attend all of the talks and even try to speak with some of the many interesting attendees. What I never know is what I will learn, what Mark and I will decide to do based on what we learn, and how I will change. It is always a bit scary, but something I have come to treasure. It also forces me to write some blog entries. This year is different, however, as the week comes near the end of my 7-week sabbatical. That means I’m way more rested and less pulled in different directions than usual. I’m not sure how that may change things. Last year, one of my goals was to wear Limit Your Greed (LYG) T-shirts and try to have conversations about LYG. Now that the book itself is out, I’m hoping to have conversations about it and hand out a few copies. I registered yesterday and got my gift bag this morning. They have changed the way they do the gift bag this year. Basically, I got a nice piece of carry-on luggage from Rimowa, a water bottle, and a bag. Instead of lots of stuff folks may not want, we each got $125 to spend at a couple TED stores. So, I don't actually know yet what I will get! Around 25 members of the 2018 TED Fellows class each spoke for about six minutes. The talks were not great, but a few of them were very good. We heard from people working in the areas of migrant rights, glaciers, gender violence, mathematical models of infectious disease, astronomy, evolution, preserving the Cubango river in Africa, urban ecology, low-income energy costs, and human tissue regeneration. A few of the talks stood out. These included Romain Lacombe, a self-described environmental entrepreneur, who developed a smartphone-enabled air quality monitoring device. The goal of the device is two-fold. First, it allows people to see where and when air quality is poor and change their behavior in response. So, if someone sees that running in the evening on a particular road encounters a lot of pollution, the person can run at a different time or location. The other goal is that when enough people utilize the devices, city-wide maps can enable policymakers to see in real time the pollution in their cities and take appropriate action. Rola Hallam is a doctor who told of the tragedy of hospital bombings in Syria. She works with healthcare professionals in Syria doing heroic work attempting to provide aid to people in these facilities. They get very little outside funding, so she created the CanDo foundation to help funnel money to them for the cause of providing healthcare to the Syrian population in desperate need of it. By using locals to do the work, they have managed to open new hospitals in Syria for the relatively low cost of hundreds of thousands of dollars. It helped remind me that there are important causes in the world on which individuals can have a real impact with relatively small amounts of money. Essam Daod is a child psychiatrist who tries to help children who are part of the flood of refugees into Europe. Among the over one million such refugees are hundreds of thousands of children. He described himself as a first responder to the psychological stress of young refugees. He stressed the importance of intervening with these children as soon as they arrive to help them reframe their traumatic journeys as heroic rather than tragic. 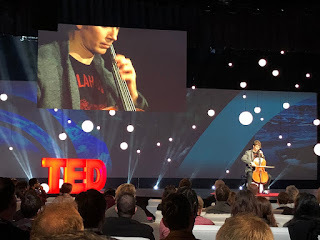 Paul Rucker opened the second session by playing the cello in a very non-traditional, but enjoyable way. He later spoke in the session and was the only TED Fellows speaker that I gave a standing ovation. As an artist, he described how he collects artifacts of slavery such as branding irons and shackles. Seeing them really helped me understand in a new way the horror of slavery. He also showed KKK robes that he created in different colorful materials. In trying to write about his talk, I can't adequately describe its impact on me. Suffice to say, I was moved by it and left wondering what I can do to foster racial reconciliation. 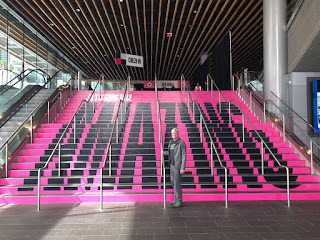 In the early evening, the week began in earnest with the first session of the conference and the ominous title of "Doom. Gloom. Outrage. Uproar." The first two speakers were late, and very topical, additions. They were well received by the audience, but I didn't feel they had much to add to the discussions in their hot topic areas. Tracee Ellis Ross, the star of the TV sitcom Black-ish, told a story of a friend who while in line at a Post Office had a man pick her up and move her aside to get to something. The woman could not understand her emotions, but she was furious. Ross attributed it to bottled up rage because of centuries of "men helping themselves to women's bodies." While the story was thought provoking, her call for women to unleash their fury did not sit well with me. I don't think the world needs more fury, it needs more dialog and understanding. I (and other men) need to hear about the things that women experience, including their fury. However, holding individual men accountable for centuries (come on, it has to be millennia at least) of loutish behavior by other men is unlikely to help anything. Individuals need instead to be held accountable for their own behavior and need help to understand when they have behaved poorly. Diane Wolk-Rogers is a history teacher at Marjory Stoneman Douglas High School. She told of her experience at the recent shooting at her school. It was an understandably emotional talk where she spend the bulk of the time arguing for gun control and against the NRA. Unfortunately, I didn't feel she said anything different than folks have been saying for years. The middle of the session consisted of Jaron Lanier decrying social media which he prefers to call "behavior modification empires," The Soul Rebels playing some fun New Orleans jazz fused with hip hop, and Zachary Wood calling for people to dialog with folks who they strongly disagree with. Neither Lanier or Wood were great speakers, but they did say some things well work thinking about. The final speaker was Steven Pinker. His talk was basically a nicely done summary of his book, Enlightenment Now: The Case for Reason, Science, Humanism, and Progress. What he did in his talk (and his book) is to use data to show that we are safer, wealthier, healthier, and happier than we have been in the past. This flies in the face of most people's general feeling that things are getting worse all the time and we are headed for doom. I'm currently reading that book and would whole-heartedly recommend it to anyone. If you don't feel like reading it, wait for the TED talk to come out and watch it instead. 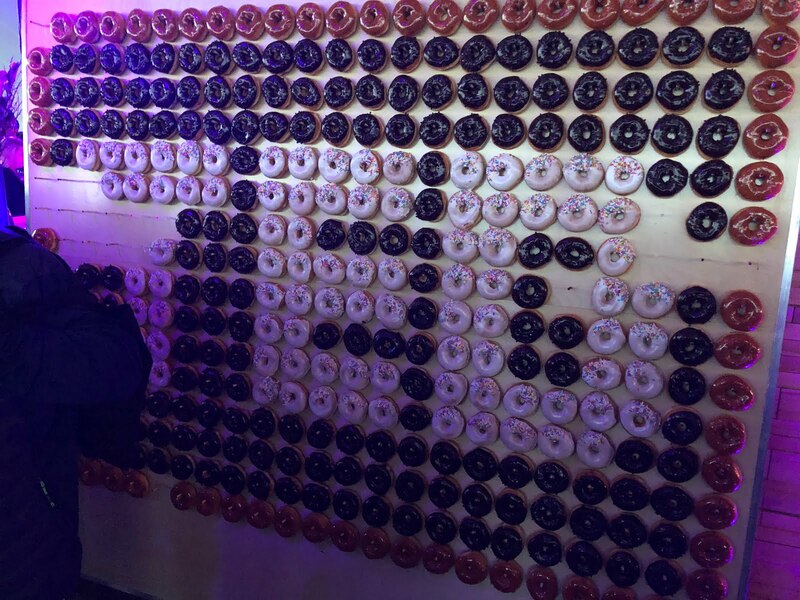 What party is complete without a logo wall of donuts? The day finished with an evening party. 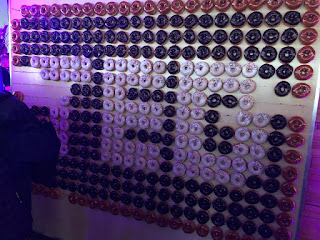 The food was good and the desserts included a wall of yummy donuts in the shape of the TED logo. There were dancers performing on ropes suspending them outside the windows and there were fireworks that I did not stay late enough to watch. It was a good party! 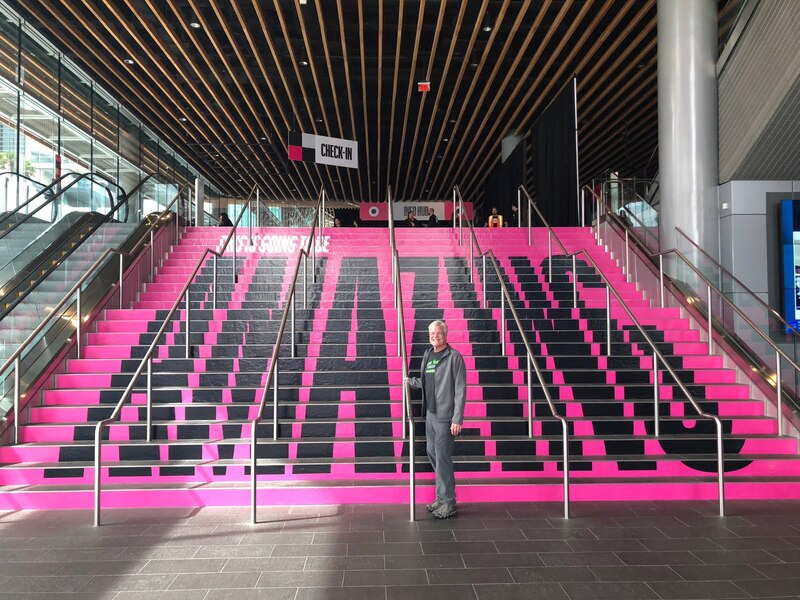 Neither Mark and I are big minglers, but we did have an interesting conversation with the CEO of an oil and gas company who saw his quarterly revenue go from $200M to $20M in the last bust cycle. He was proud of he managed to not go bankrupt and survived by transforming his company into an environment/technology company. There really are a wide array of interesting folks here at TED 2018. Tomorrow, is a long day of sessions and opportunities to meet more such folks. And, to give out copies of Limit Your Greed to such influencers. I need to get some sleep to be ready for it! My goal in this blog is to force myself to better organize my thinking, especially thinking Biblically. Easier said than done, of course! Copyright @ Bill Catchings. Simple theme. Theme images by luoman. Powered by Blogger.